While industries are the backbone of today’s modern world enabling mass production of goods catering to ever increasing population, it is our responsibility to safeguard them against reckless use of environment. Unfortunately as a negative side effect, industrial pollution affects the world we live in. Its our responsibility to give our next generation a greener world for a better life. Embien Technologies works with industries and develop environmental monitoring systems to monitor and control the effects of the operations. In one such instance, we have deployed such a system for a sugar cane processing industry as described below. Governments around the globe have created norms and regulations to monitor the industries and to keep the pollution under check. In India, each state has Pollution Control boards that are mandated with the responsibility of managing the negative impacts of the industries. To enable effective industrial pollution monitoring, they have quantified the permissible amount of harmful outputs from industries and detailed tracking of these are needed in format specific to the Pollution control boards. One of our end customers has a sugar manufacturing industry where the sugar cane are received and various stage of processing are done to get sugar as the final product. In addition to that power co-generation is done along with molasses and bagasse as by-products. Unfortunately the industry also produces harmful outputs like Carbon Mono-oxide, nitrous oxides, particle matters etc, that causes air and water pollution. Embien was tasked with the process of developing the Environmental monitoring systems that tracks the amount of pollution caused by the industry. Apart of this it is also important to monitor the performance of various stages of the production process as well as the flow of liquids in the system. As the factory spans across a large area, there is a need of complex network to monitor and control the same. Embien along with its System Integrator partner took up the case and successfully developed and deployed the system. As a part of the PCB requirements, the various parameters related to the air quality and water quality must be displayed in the main area of the factory. As the factory floor is larger and must be visible to many persons easily, large LED displays are needed that can be mounted at a height for wider visibility. These industrial marquee displays designed support rolling text to provide detailed information as possible. The industrial display boards connected to a real time network from where the production as well as the pollution data are read and displayed. The PCBs mandated that the data displayed must be real time and not be something stored in a server. But it is essential to keep logs of the pollutant levels. So the large led display boards must fed real time data while the same is also stored on a central server. Industrial LED displays with Dot Matrix Display (DMD) with custom hardware for LED display control. To acquire multiple parameters from various machines, a custom data acquisition device was developed with RS485 connectivity. The device has multiple analog inputs that can be used to interface standard 4-20mA and voltage sensors for monitoring industrial water pollution as well as industrial air pollution. The pulse counter inputs can be used to connect flow meters to monitor the level of fluids flow. A 16x2 Character LCD and navigation keypad enable easy configuration of the device. The device is developed based on LPC11UXX MCU operating at 50MHz frequency with features including 20KB RAM, 128KB flash, high resolution ADC, rich connectivity’s, internal EEPROM, high resolution timers etc. Option for on-site programming is enabled with USB interface for future software upgrades. 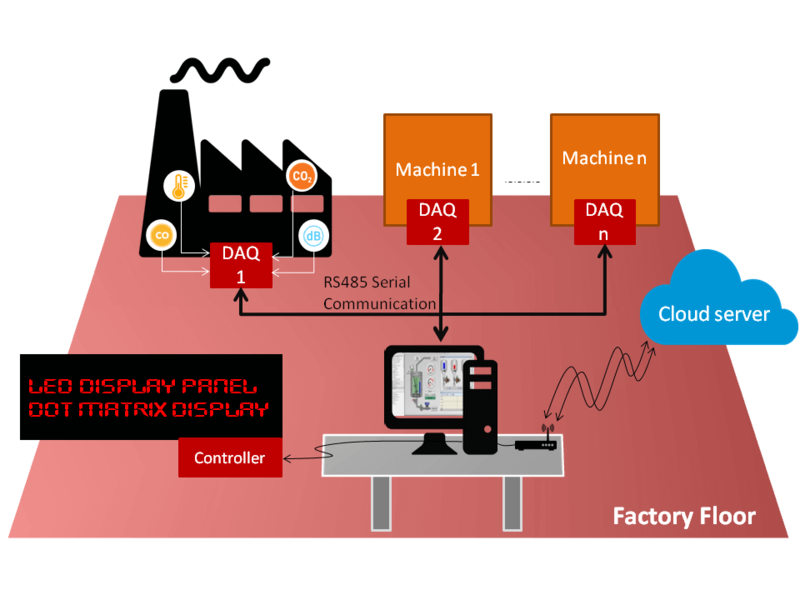 All the data from the data acquisition devices are read by a Windows based application that was designed which runs in local PC available in the factory floor. The primary responsibility of the application is to consolidate the collected data and present it in a format suitable to the industrial display. It includes configuration settings such as transition time period, acquisition device ID selection whose data are to be displayed, startup message, alarm conditions etc. The collected data will be sent to the central cloud for storage and future analysis. The application also has the capability to fetch the data from the cloud and transmits the same in a suitable format that can be read by the LED controller board. Graphical alarm notifications are provided in the application and the same will be displayed in the LED display based on the alarm conditions set in the configuration settings. Developed with C#, the intuitive UI with detailed floor plan provides a bird’s eye view of the factory. All the data’s acquired from the remote data acquisition device are logged in the cloud server. Each acquisition device will be assigned with individual device id and the data will be logged corresponding to the device id in order to differentiate each machines values including date/time information. Also dedicated web page has been created to view the acquired data’s anywhere in the world. The webpage will show the acquired data’s in table format with time stamps. Multiple User name and password are provided for more than one user login and there are options for setting the emergency alarm conditions. Among various display options available in market, LED Dot Matrix Display (DMD) is more flexible and comparatively low cost. Since more than one DMD can be daisy chained to form a big display, they are commonly used in open area applications. In this application, three to five DMDs, based on need, are daisy chained to form a LED display and the data’s are displayed in two row format. The data that are to be displayed are fetched from the cloud (via Local server application) and to display the texts that exceed the length of the display, scrolling effects are added with configurable transition periods. To control the LED display, a custom hardware (LED Controller) was designed based on NXP’s MKL14 MCU powered by ARM Cortex-M0+ core operating at 48MHz frequency. It receives the data from the local PC (with server application) and pushes the data to the display. The communication between the LED controller and local PC is via RS232 serial interface. Manual switch arrangement supports varying the display brightness suitable to the ambient light conditions. Likewise many LED displays are placed suitably in the factory floor and each display will have a LED controller connected to it. In addition to the parameters display, the LED controller includes buzzer for audible notification of the emergency condition. The hardware is enclosed in an enclosure made of ABS plastic such that it can operate even in rugged industrial conditions and polluted environments. The industrial environmental monitoring system developed proved to be a valuable tool for the customer in tracking the pollutant outputs. They are able to provide a comprehensive report to the Pollution Control board in a convincing way. As a value addition, they could also monitor their entire factory efficiently.